Home Artificial Intelligence Artificial Intelligence and Home Automation, a.k.a. My Home is Smarter Than Yours! Artificial intelligence is all around us, to say the least. It’s invaded our workplaces, our cars, our phones and every aspect of personal and professional life. But no other place has seen the most meaningful impact as home automation. That’s as close to home as AI can hit. Literally. What are the areas where AI has already encroached upon as far as our domestic dwellings are concerned? Plenty, and we’re not even including the smartphones, tablets and desktop computers that are our constant companions at home and everywhere else. We’re talking purely about smart applications in the average home. The reason we’re focusing on the “average” home is that the real test of a technology is its reach. If a few thousand rich people can afford full smart home automation, that’s not a social benchmark. But when a technology creeps into the average middle class home, that’s when it’s truly made it big. And that brings us to the first of many technologies that have made themselves at home in… well, the home. 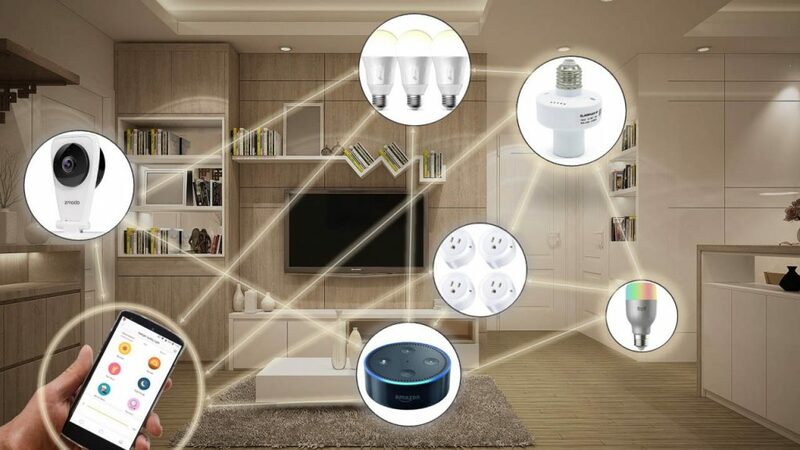 Smart speakers are just one class of product that embodies the emergence of voice-based intelligent systems that have a place in our hearts and our homes. There was a time not too long ago when it was thought that Alexa and Google Assistant were secretly listening to and recording private conversations we had with our family members or when on the phone with someone. That fear has since been assuaged. Estimates by eMarketer indicate that well over 200 million people will use the services of a smart speaker at least once a month. And that’s a mouthful for a voice-enabled technology that’s only a few years old. it’s almost like Apple’s big milestone when it started selling over 200 million iPhones a year. Nearly every major tech player is now firmly in the smart speaker space, with new models of speakers coming out at a rapid clip. For now, Amazon is the clear market leader, but companies Google and Apple have as much or more marketing muscle to take on the the king – Echo – and queen – Alexa. But are they really taking advantage of their strengths, or is Amazon pulling the proverbial rug from under their unsure feet? Just at it did with public cloud computing infrastructure, Amazon has somehow managed to stay in front and even expand the gap between itself and the rest of the pack. On the cloud front, Microsoft gave Amazon a run for its money, and Google is now playing catch-up, but it looks like Amazon, which now has nearly a dozen Echo-Alexa products including Echo Link and Echo Connect. And it’s not just about smart speakers. Alexa and Google Assistant-enabled appliances and home products are all set to become the norm, powering smart ovens from Whirlpool, smart toilets from Kohler, smart tablets and displays from Lenovo and Archos, security products from Lockly, Ring (Amazon-owned) and Schlage, smart rollable TVs from LG, smart soundbars from Klipsch, smart headphones from Jabra, Sony and JBL, smart showers from Moen and even smart HVAC thermostats from Daikin. Talk about talking technology! It’s clear that voice is the future of touch. While touch-enabled devices brought us closer to technology by giving us the tactile experience, voice-enabled tech is bring us even closer by integrating an even more powerful auditory experience. While voice might be the great enabler of our times, AI is not just about voice interaction. Not everything will be integrated with voice capabilities. Home security is another ripe area for AI to exploit, and in this case it’s vision that wins over voice. Computer-vision-based AI systems are also proliferating at an impressive pace. Yes, they are likely to be integrated with Alexa or Google Assistant as well, but their strength lies in their ability to compute what they capture on visual and other sensors. The Deep Sentinel Smart Home Security System is unique in that it utilizes a hybrid model consisting of threat recognition software powering its surveillance cameras combined with its LiveSurveillance monitoring by real humans. The computer monitors for and identifies threats versus noise, while the human operator intervenes in seconds when required, even engaging local law enforcement in the quickest time possible. A surveillance perimeter is set up around your home using smart cameras powered by advanced algorithms that can alert a human operator at Deep Sentinel HQ. When an urgent threat is detected, like someone trying to break into your home, the operator can vocally warn the intruder to back off and that law enforcement has been notified and is on the way. This is one of the best uses we’ve seen of the Human-AI model for home security. It’s a perfect example of how AI can complement and aid humans rather than replace them in the workplace. Another interesting product in this category – one that was showcased at CES 2019 earlier this year – is the SimCam, an AI camera capable of being trained to recognize faces. It can also monitor pets and objects around the home, and can be trained to monitor a specific location, such as the front gate or the back door. What’s unique about this product is that all the AI computing happens on-board with the help of an Intel Movidius Visual Processing Unit (VPU). Memory cards hold whatever footage is captured so it’s basically a cloud-free product that is self-sufficient. There’s also two-way talk capability so you can talk to the delivery guy or an unexpected guest while you’re at work. What’s happening with home security systems now is a deeper integration with cloud, but also a distinction that takes the computing power to the edge. In other words, edge computing. Smarter and more capable processors are at the heart of this because AI requires tremendous computing power. And it looks like we’re slowly getting there. Another development to keep an eye on is affordable home automation. That hasn’t happened yet, but the tone has been set for mainstream products that will eventually push out traditional ‘dumb’ appliances. Again, voice is a key component of this equation, but we’ll also be seeing touch and gesture control as being central to the idea of an automated home. Not everyone wants to be vocal about telling their smart homes what to do; some just want to quietly gesture or even do it on a traditional touchscreen. Consider the FIBARO SWIPE, a wireless gesture control pad that recognizes simple swipe movements in the air and can be programmed for more complex gestures. Since it’s wireless, it can be put up like a painting on the wall, and it even works through wall paper. Integration is not very wide at this point, and it only works with Z-Wave hubs. But that’s not the point at all. This product is on the threshold of what could well be a viable rival to voice-enabled devices. A similar product called Bixi from French startup Bluemint Labs is a small table-top utility that works with your smartphone or tablet. If your hands are dirty and you need to pause the music, just use a gesture. These products are a long way from making it to mainstream consumer consciousness, but then, so are the really expensive smart refrigerators and other appliances made by big names like Samsung and LG. Just as voice-enabled technology was brought down to under $100 in a relatively short amount of time, these other smart devices that depend on vision, gestures, touch and other alternatives will also become more affordable over time. The underlying theme, however, is common, as is the challenge: how can we bring the computing to the device rather than depend on the cloud? Every domain from self-driving vehicle technology to smart home automation begs that question. As AI programs get more complex, their computational needs grow exponentially. The hardware is struggling to keep up at this point in time, but that’s not a permanent situation. It’s been 22 years since we broke the teraflops computing barrier, and they’re already in desktops. It’s only a matter of time before petaflops are powering our personal devices. Wherever software goes, hardware will follow. Therefore, it’s only a matter of time before the cloud merely serves as a storage archive for computations that have already happened on-site. The Internet of Things will make sure of that, and microchip makers are already putting out speed-record-breaking products at a rapid clip. Artificial Intelligence (AI), Machine Learning, Deep Learning, Neural Networks – What Do These Terms Mean?